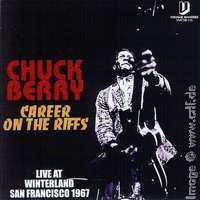 In early 2008 I wrote a blog article on the various recordings of Chuck Berry concerts in San Francisco in 1967. Three of these shows are only available for listening online at Wolfgang's Vault, a commercial site which runs on the archives of promoter Bill Graham. In this blog article I explained a legal (at least here) method to create an audio CD from the online show. And guess what, someone did! On eBay and in various places you can now find a CD titled "Career on the riffs", which contains the show of December 29th, 1967. The CD has a label (Vintage Masters) and a number (VMCDR-116). The cover looks professionally made, but all in all the CD is handmade: a burned CD and a home printed cover. Since Wolfgang's Vault does not allow you to sell CD copies of their contents, this seems to be an illegal copy. Let me know if you know better. By the way: The creators of this CD cannot have learned about it here, because if they had, they would have omitted Steve Miller from the printed band listing.